I am often asked where to buy photography books in London. Most bookshops will have a small photography section but a few bookshops are definitively worth the detour. The first one is on the ground floor of Foyles on Charing Cross road (Foyles' flagship store). It not only has a good section of books by photographers and on the art of photography, but it also has a large selection of zines which I highly recommend (I have not yet found another bookshop with a dedicated photography zines section). There is also a small selection of signed books. Foyles encourages browsing and if you take a book up to the cafe (highly recommend it; on the top floor), you can browse your book while sipping coffee. As you walk out of Foyles and walk south on Charing Cross, you will pass Koenig Books which specialises in art books. It has a small selection of photography books but downstairs, there is a larger section of photography books on sale - you'll find some affordable gems. Tate Modern has two bookshops, each with a good photography section but it is the bookshop in the new building which has the largest selection of photography books. Somehow people will easily find their way to the bookshop at the bottom of the Boiler House (the main building), but fewer people seem to be aware of the bigger bookshop on the main floor of the new building (the Switch House, now known as the Blavatnik Building). It is that second bookshop which has the most substantial collection of photography books, magazines and DVDs. The section is well stocked and looked after and new books are regularly highlighted. It is difficult to come out of this bookshop without buying a book! If you are at Tate Modern, there is a little secondhand bookshop just across it as you come out the ramp; it has a small but very good photography section (look out for signs for "Art Books"). Waterstones' flagship store on Piccadilly Street (Europe's largest bookshop) has a good photography selection in its Art department, although it is not as good as Foyles or Tate Modern. 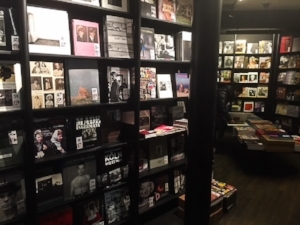 The wonderful Photographers Gallery in Soho has a small but very good photography section in its basement; it does however have the largest photography magazines selection I believe (but fewer zines than Foyles). Finally, do not miss the photobook fair Offprint during Photo London in May: you will find a unique selection of photography books and zines from all over the world. Close-up of the extensive zine section in Foyles.